Inspy Romance is closed today in honor of America’s Independence Day. We want to take a minute to wish you all a Happy Fourth of July! We will be back to our normal schedule bright and early tomorrow morning. In the meantime, be safe, and enjoy the day! Hope each one of you have a happy and blessed 4th of July! Thank you Rachelle! Same to you! May the freedoms made possible by our founding fathers forever stand strong!! Happy and safe 4th of July everyone!! Let’s remember the true sacrificial love of God for our freedom….His son Jesus Christ! Amen to that! It’s only because of the freedom we have in Christ that we can truly understand/appreciate the independence we have as a nation. 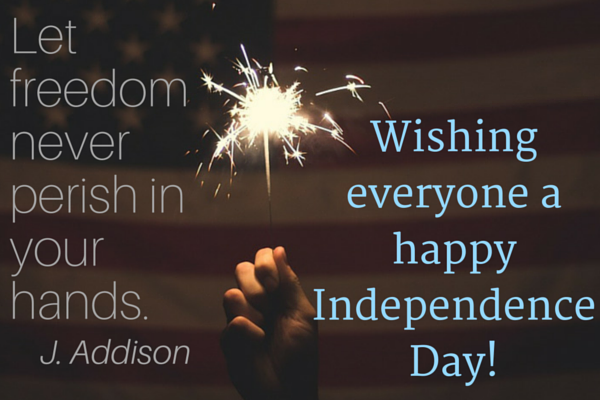 Happy 4th everyone at Inspy Romance!